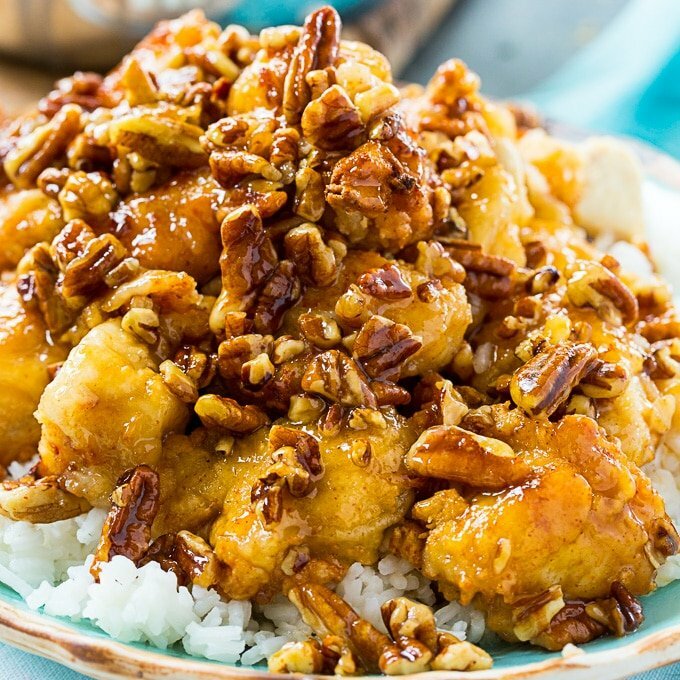 Honey Pecan Chicken- tender pieces of white chicken meat coated in a buttery sweet Honey Pecan Sauce. Serve over white rice for a southern meal you will want to have again and again. The chicken is so tender and moist and the sauce is so good, you keep wanting to have just one more piece. The buttery, crunchy pecan pieces are my favorite. The chicken is cooked in two parts for maximum flavor. First it is fried and browned in oil and then coated in the Honey Pecan Sauce and baked. 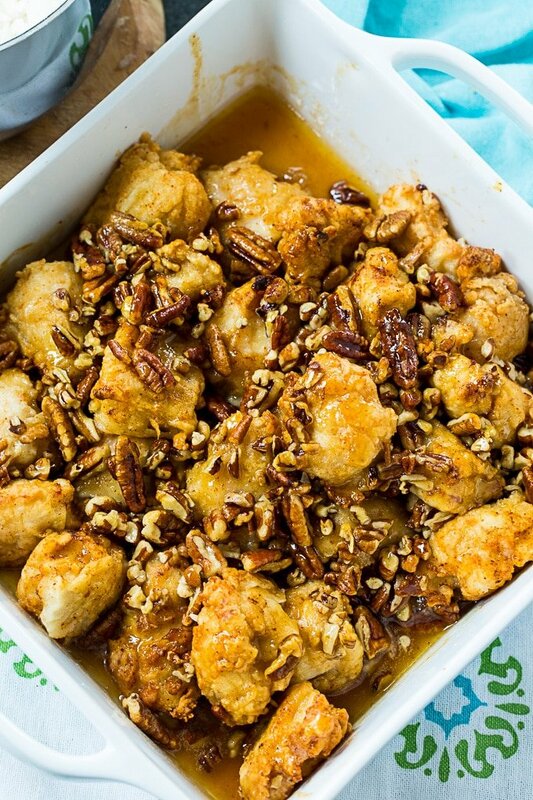 This sweet, savory and buttery chicken dish is one of my favorite chicken recipes. 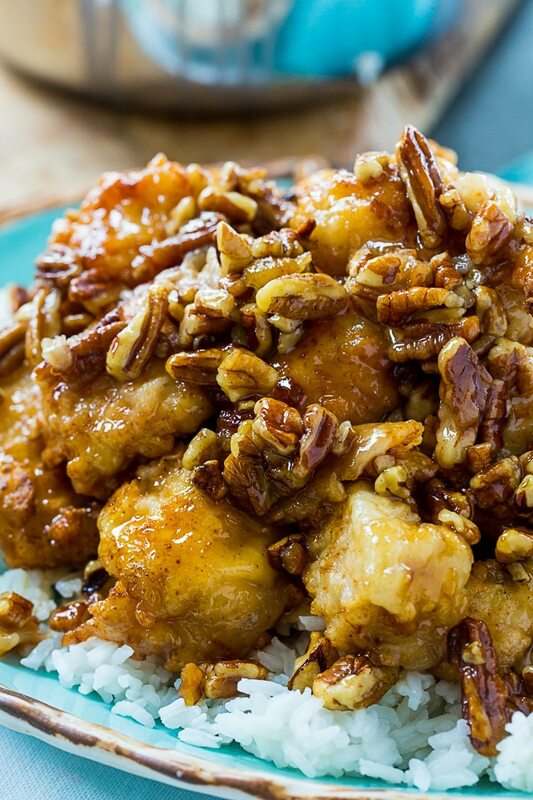 To make Honey Pecan Chicken, cut two chicken breasts (enough for 4 people) into 1-inch pieces. Use 3 chicken breasts if you need enough for 6 people. Let the chicken marinate in the buttermilk for at least 1 hour. This will help tenderize the chicken and keep it moist. Next coat the chicken in some seasoned flour and let it sit a good 20 to 30 minutes. This will allow the flour to get partly absorbed by the chicken which will result in a better coating. Brown the chicken in oil. No need to cook it all the way through at this point. It will finish cooking in the oven. 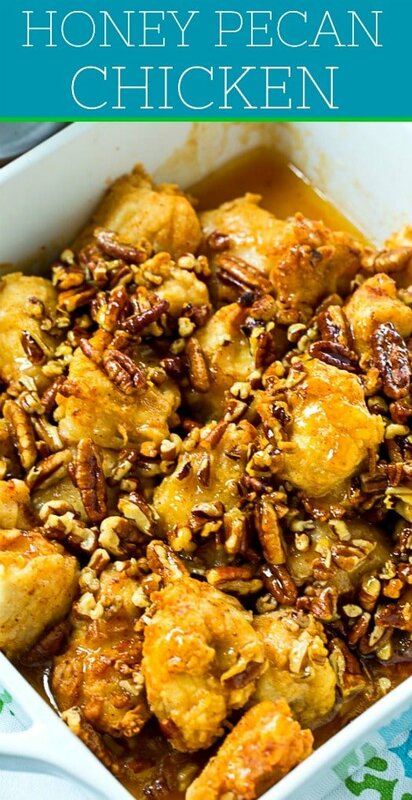 Make the easy 4-ingredient Honey Pecan sauce. Place the chicken pieces in a baking dish and pour the sauce over the chicken. Bake for about 15 minutes to cook the chicken through. You definitely want to serve this with rice to soak up the excess sauce. Besides that, keep it light. Maybe a green salad or some green beans. Cut chicken into 1-inch pieces. Place in a medium bowl and pour buttermilk on top. Refriegrate for 1 to 4 hours. Combine flour, garlic powder, salt, and cayenne in a shallow bowl. Drain off buttermilk from chicken and toss chicken pieces in flour mixture to coat. Let chicken pieces sit for 20 minutes. Pour 1/2 inch oil into a large pan. Heat oil until hot. It should sizzle when you drop a pinch of flour in it. Fry chicken just until browned. Remove to paper towels to drain. Place in a 9-inch square baking dish. In a medium saucepan, melt butter. Add honey, cayenne, and a pinch of salt. Bring to a boil and cook and stir until thickened some. Stir in pecans. 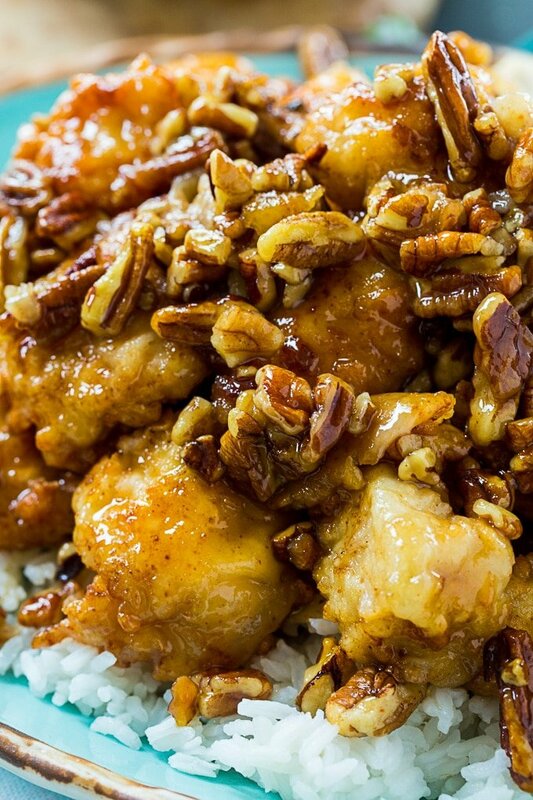 Pour honey mixture over chicken pieces. Bake in a 350 degree oven for 15 minutes.